In high schools across the country, 9th and 10th graders will be taking the PSAT test in the next few weeks. Many of them have no idea how important this test is for their college prospects! Megan Dorsey breaks down why the PSAT is so important to students and should be approached with a healthy respect. First, the PSAT is a strategic stepping stone to the SAT, and it’s much cheaper (only $14 compared to $50)! Although many families like to wait to take the real SAT as a “practice test,” Megan urges them to start with the PSAT in 9th grader (yes, homeschoolers, this includes you, too). 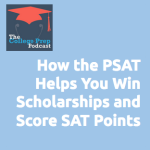 She explains how to use the score report to study for the SAT and improve your scores. 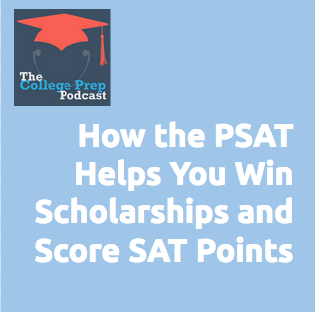 She also explains how to use the PSAT scores to predict what your SAT scores will be. Secondly, for students who score well on standardized tests, there are significant scholarships available for college. These students will especially want to take the PSAT as early as possible so they can identify whether they are high scorers and then study to boost their grades into the National Merit Scholar positions. Finally, Megan and Gretchen discuss whether, when, and how to study for the PSAT. For example, there is no need to stress out and make 8th graders start studying. However, there might be a benefit in taking an 8-week class to begin thinking about test taking strategies. Megan breaks down what studying is appropriate and what is too much. Overall, keep in mind: When used well, the PSAT is a strategic stepping stone to high performance during the SAT and into a great college. For more information about the PSAT, check out College Board’s website.